The picture of the high tea set above is the one that I had two months ago. The Connoisseur Concerto is currently serving a Spring tea set for March and it comes with different scones, sandwiches and cakes with tea/coffee. I like the idea that The Coffee Connoisseur TCC is changing the cakes and pastries for the high tea set every month. In addition, the affordable prices make it possible for everyone to enjoy a leisure afternoon tea. 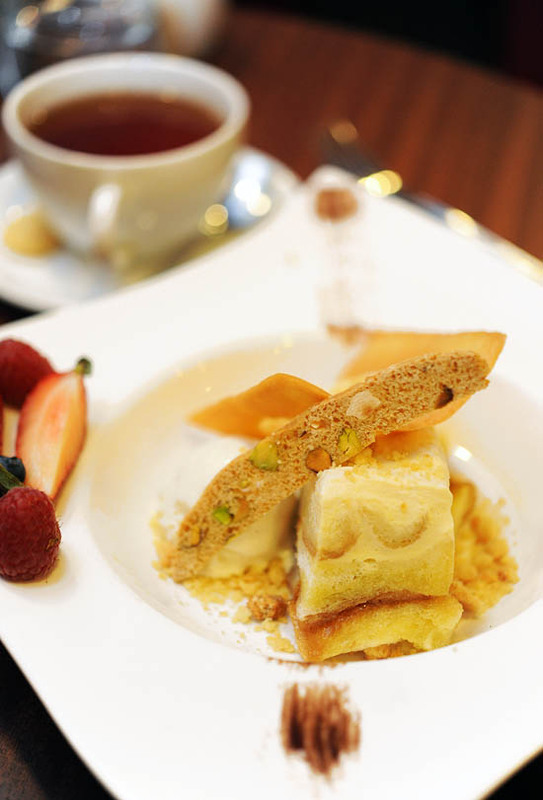 Besides sharing the High Tea Set, we ordered another two desserts from TCC’s ala carte menu. Two of my friends are big fans of chocolate lava cake, and they have tried many places for this popular dessert. When I asked them where can I get the best molten chocolate lava cake in Singapore, they replied: TCC. After trying The Coffee Connoisseur’s Dark Chocolate Cake ($11), I have to agree with them that it is amongst the better ones that I’ve had. DO NOT order TCC’s Bread and butter pudding ($11.5). You have been warned. With so many cafes in Singapore, The Connoisseur Concerto is a good place to have a) desserts for afternoon tea, b) a hangout place to meet friends and c) late night dining at their 24 hours outlet located in Orchard road. I am not too sure about the main course there, but most of my friends who frequently eat at TCC seem to agree that they have pretty decent food. How about you? What do you usually order at The Coffee Connoisseur Cafe? I love their Caesar Salad! Their mains are pretty decent. The piece of cholocate cake looks beautiful and delicious! it seems like a very nice place to visit! What’s wrong with their bread and butter pudding? I really wanna try their high tea set now!!! Damn. I had not been visiting TCC for a long time as I got bored with their menus. its Shroomsbite was a boom! and i got try its Devilmisu bfore, quite appetizing but e portion is too big for me. over all, TCC is a worth-try.